Q. 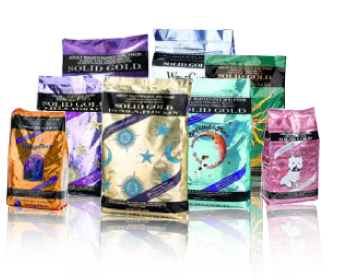 Some of the Solid Gold Pet food bags are hard, rigid and ”vacuum-sealed like” and some bags are softer and loose, what causes the difference? WolfKing, Wee Bit, Wolf Cub, and Hund-n-Flocken are currently mechanically palletized. This produces a neater, more consistent look to the finished package and also the end product has less of the “vacuumed look”. All the other Solid Gold foods, are manually palletized, leaving them more apt to have the odd shaped bags, more loss of air through the one-way value during transportation, resulting in a more rigid bags. Solid Gold did Oxygen-bomb testing, which is a accelerated shelf-life testing, to find out if there is a difference in shelf life of rigid versus looser bags of food and there was not a difference. 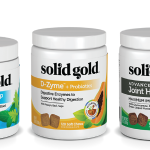 Solid Gold Health Products has pioneered the use of foil, flexible-barrier packaging in the pet food industry. Extensive laboratory and consumer tests have shown that this type of packaging has considerable advantages over traditional paper “multi-wall” packaging. One of the primary advantages is the extended shelf life and freshness that these types of bags afford their contents-without the use of artificial preservatives like ethoxyquin, BHA and BHT. 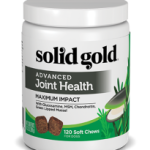 Tests have also shown that foil barrier packing helps to maintain the palatability of food inside, and also helps to sustain the potency of nutrients such as vitamins, minerals and amino acids. In 1999 Solid Gold improved our foil packaging further, with the addition of a revolutionary one-way valve system to hermetically seal the bags. This provides even more extensive protection from the external environment and outside contaminants. Hermetic sealing gives the same effect as vacuum packing, in that the bag is air-tight and impervious to external influence. All Solid Gold Food is stamped with a best used by date. The food should be stored in a cool, dry place with the top of the bag folded down after opening. You may notice that some bags are very rigid, where the air has been completely expelled through the one-way valve. The “vacuumed” effect occurs in bags that were stored in the lower part of a pallet or passed through high altitude (such as the Rocky Mountains) on the way to their final destination. Other bags, which are not rigid, still have the airtight seal and protection from the outside environment and are preferred by some customers and stores, as they are easier to stack and lift. We are alway happy to offer our assistance, please contact us if you have any additional questions. Supplements for Dogs & Cats! Disclaimer: The health-related information on this website is meant for basic informational purposes only. It is not intended to serve as medical advice, substitute for a veterinarian appointment or to be used for diagnosing or treating a disease. Users of this website are advised to consult with their veterinarian or other qualified health care provider before making any decisions concerning health.